In the heart of Savannah, Ga., just a few blocks west of the city's historic district, a housing development known as "Sustainable Fellwood" has arisen at 1401 Fellwood Drive. As a test project in the U.S. Green Building Council's national pilot LEED-Neighborhood Development program, Sustainable Fellwood is one of the nation's first green mixed-income housing projects. The $50 million development includes 200 multi-family housing units, 100 senior housing units, 13 single-family homeowner units, and retail, medical and technical space. But this housing development is more than just environmentally sustainable, notes Martin Melaver '04, CEO of Melaver, Inc., the real estate company overseeing this and other developments in Savannah. By partnering with community leaders and Savannah residents on health and education initiatives, it has become a socially sustainable entity as well. A nonprofit health clinic plans to create a second facility near Sustainable Fellwood to provide health care for indigent, underinsured and non-insured residents. The local school system will provide after-school tutoring and educational programs to children in the area. And Melaver is working with a nationwide program called "First Tee" to bring after-school golf programs to underprivileged children in the community. "What we've done is look outside the physical site to see who our neighbors are, what they do and what they care about," says Melaver, a graduate of the Executive MBA program (EMP-58). "When you go to the community and say, 'What would you like to see? What do you need?' good things will happen. I know that sounds kind of Pollyanna-ish, but it works." This organic approach to sustainability is at the heart of Melaver's business model, which advocates that businesses must strive to restore the communities and environments in which they operate in order to be successful. In other words, taking care of the environment isn't enough; businesses must also make a contribution to society if they want to survive and thrive. 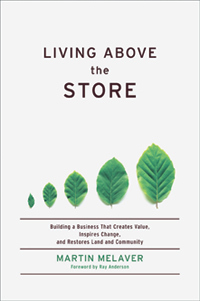 In his new book, Living Above the Store: Building a Business that Creates Value, Inspires Change and Restores Land and Community (Chelsea Green, 2009), Melaver provides a road map for achieving sustainability, and explains how the sustainable practices of a real estate company translate to other fields of business. Kellogg World: What are some of the challenges of investing in sustainability? Martin Melaver: I think the biggest challenge to moving in a sustainable direction is an internal one. It's getting over one's fear of not conforming — fear of taking a path that's less tried and less familiar. I look at external obstacles as versions of an imaginary line: you just go around it. The thing that keeps you from going around it is your own internal frame of mind and how you see things. KW: What are some of these external obstacles you've faced? MM: We've seen local building ordinances that make little sense in today's era of limits on our natural systems; investment capital that doesn't get the longer view of investing along multiple bottom lines; tenant-rep brokers who, because they are transaction-oriented, don't like non-cookie cutter deals. In the early days, we simply found ways around these obstacles. Now, with a more maturing "green" market, we find those voices and pockets of resistance largely irrelevant. KW: What drives your passion for sustainability? Is it as simple as you think it's the right thing to do? MM: Yeah, it really is that simple. I think there's sort of a common-sense piece to it too. Which is, if I gave you the choice of waking up in the morning and collecting a paycheck versus getting up in the morning with a sense of purpose about what you do, what path would you take? 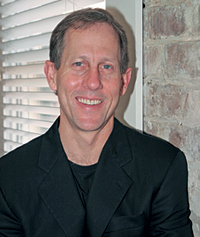 KW: If it's common sense, why aren't more executives adopting that mindset? MM: I think many, many people in leadership positions don't realize how open the field is, and how many options they have. [They believe] that's how it's been and that's how it is and that's how it will always be. I think a lot of people don't consider other possibilities. They think about walking within a confined set of parameters that they've inherited. KW: What would you say to an executive who needs to be sold on sustainability?